Today, Ambassador Safira Deborah tweeted that she would stop using Twitter herself because doing so was distracting from the twin goals of “peace and stability” that the United States of America had in Libya. It was unclear whether it was her communication choices that led to the decision, the reception she encountered on the platform or some combination of the two factors. Twiplomacy created a timeline of her tweets, if you want to see them natively on Twitter. The ambassador clarified that, while she would go silent, the United States delegation to Libya would continue to use Twitter on the embassy’s official account,@USAEmbassyLibya. “We shall continue to post official statements on our embassy FB account. To all those responsible & thoughtful Tweeps out there, thank you. There was some context for her apparent decision, from a few hours before the statement: the ambassador tweeted about violence in Tarhouna, a town to the southeast of Tripoli, and experienced a wave of angry tweets in response. If you search Twitter for her username, the response to her decision to leave a field of engagement in what might fairly be described as an information war was heated. In the wake of this choice, it will be interesting to see whether the State Department offers any additional guidance for its ambassadors using social media to directly engage the people in the countries their mission is in. Will angry, abusive tweets that harass or threaten ambassadors prove sufficient to poison the well for public diplomacy in less than 140 characters? Yes, it matters if senior staff at your institution use social media. Here’s why. Over at GigaOm, Mathew Ingram asks whether it matters whether some editors and reporters at the New York Times tweet or not, riffing on the “Twitter graveyard” that Charlie Warzel dug up at Buzzfeed. As Warzel notes, dozens of Times staff are dormant or are “eggs,” with default accounts. My answer is simple: yes, it matters, and as I clarified to Patrick LaForge, a long-time, active Twitter user who I think uses it quite well, this isn’t about how they tweet but whether they do it at all. Full disclosure: I gave the Times a much longer, richer answer regarding social media when their researcher interviewed me for the innovation report that leaked earlier this year. I was constructively critical then and will try to be now, as well. I love Twitter. But I don’t care if @deanbaquet tweets. He does so many other much harder things so well. I’ve consulted for a number of people on this front over the years and done internal training at past gigs. Showing you are listening with a favorite or retweeting a reply that advanced a story is valuable; it’s the first step to ‘tweeting your beat.’ For instance, for Baquet, retweeting a different reporter sharing her or his big story once every day would demonstrate that he was reading his own staff and using the audience that he has accumulated to amplify stories would be a safe approach. From where I sit, leading a media organization now includes a profoundly public component, and as the “sources have gone direct,” top editors are ceding ground by not using social media to get their perspective into discussion; posting a press release online or emailing statements is a limited and limiting approach. As for whether someone can lead a newsroom effectively or not without paying attention to Twitter, knowing what your staff or those you respect in the industry are saying about you or your leadership, or how they are responding to public critique or your journalism, is relevant to understanding what their challenges or needs are. I don’t understand some arguments I see elsewhere online that engaging with readers, across platforms and email, doesn’t make the product better or make someone a better editors. The best reporters I know have active inboxes, busy phones and are constantly vetting stories with sources. The idea that products and services don’t get better through exposure to the customers, clients, readers, buyers or users and listening to their responses goes against the grain of everything we’ve learned about iterative, user-centric design over the last decade, in media organizations or out. I find that many comments, @replies, email or calls I get about my journalism makes it better — not all, by any stretch, but a lot, particularly by people who do research in the space, who do what I’m describing, who report on it or are affected by it. If you don’t think so, that’s fine. It’s been my impression that Margaret Sullivan (@sulliview) is a great public editor because she is an active listener online, not just in her inbox. I understand that some people may still feel that Twitter is dumb, inane, hobbled by a character limit or not a valuable place for senior staff to spend time. In response, I would suggest looking at how another executive editor at a towering media institution in the United States that’s also working to transform from a print-centric model is handling Twitter: Marty Baron, at the Washington Post: @PostBaron. It sure seems like Marty Baron has quite similar working conditions and roles and constraints as Baquet, and yet manages to approach public communication in a different way. Time is not the issue at the Times or elsewhere. It’s culture. It takes 10 minutes a day to log on to Twitter, read replies, search for responses to your stories (just put in URL) and send a tweet and RT another one. Anyone in government, media, academia or nonprofits who portrays doing that as a bigger time commitment is being disingenuous, perhaps because they simply don’t want to use the platform, given years of negative media reports about how people act there. 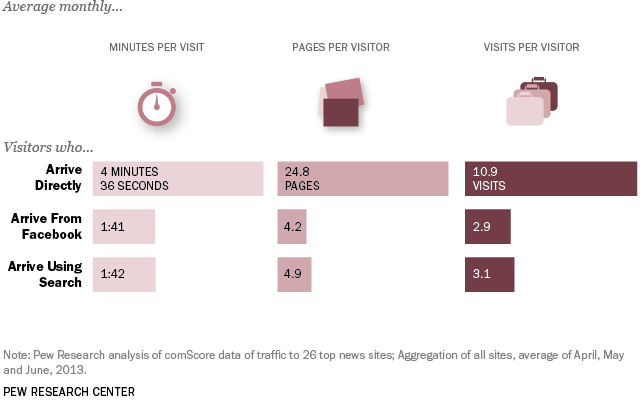 It’s certainly true that building and engaging an audience takes time, training or experiential learning, but it’s also worth noting that former Timesman Brian Stelter reported his heart out daily and managed to balance building large, engaged social networks. This isn’t the false dichotomy that I keep seeing, where it’s either you report or you use social media: it’s both/and. Creating an account on a two-way platform and then walking away, ignoring people talking to you, is like going to a cocktail party with strangers and spending your time looking at your phone and ignoring people — or occasionally saying something at dinner and ignoring what people around the table say in response. It may be better strategically, from my standpoint, not to create an account at all than to do so and then abandon it. Your mileage, as ever, may vary. “One of the biggest criticisms aimed at my generation of editors is that we created a priesthood, that we decided who was a journalist and who was not. If you hadn’t done cops and courts you weren’t a journalist, etc. That characterization was right on. We deserved the hit. Maybe I’ve misread the criticism of Baquet that I’ve seen elsewhere, but my view is exactly the opposite: the smartest young journalists coming up and the Generation X-ers (ahem) that preceded them, along with their wise elders, understand at visceral level that social media, online video and smartphones have shifted how newsgathering works, democratizing publishing to all and enabling any connected person to report and commit acts of journalism. The people formerly known as the audience, per NYU journalism professor Jay Rosen, certainly know and experiences this during every breaking news situation, with all the confusion and misinformation it creates For much of the public, a top editor publicly choosing not to participate in the hurly burly of online conversation, even to the point of not contributing, much less demonstrating listening or acting as a hub to redistribute confirmed reports, might look like he or she is remaining aloof, choosing to preach from in front of the cathedral, not minister to a circle of friends. Personally, I look forward to Baquet joining these conversations. I have faith they will be better for having him in it. Twitter is signaling that it’s going to change how it shows the timeline to users, or at least experiment with it. Here’s what the company CFO actually said yesterday, as reported by the Wall Street Journal.
.@mathewi @om he never said a “filtered feed is coming whether you like it or not”. Goodness, what an absurd synthesis of what was said. For average Twitter users, an algorithmic feed might be just the incentive to head to Twitter for breaking news like so many journalists and news fiends. Given the newsgathering makeup of the social network, the content is already there. And this would certainly help expose a great number of tweets to a larger audience. Of course this is a terrifying prospect for Twitter’s most obsessive crowd. The ones who live on Twitter. And for good reason! For plenty of journalists Twitter is a key tool in their day to day work and, for some, an integral platform in advancing their careers. But there’s nothing in Noto’s comments to suggest that this incarnation of Twitter — the core component of the social network that’s led to the platform’s meteoric rise, IPO, and global success — can’t co-exist with an algorithmically-driven timeline. At the risk of giving Twitter too much credit, it seems preposterous that the company’s executives and product team would toss out the very core of the site and almost maliciously alienate its most ardent supporters and users. Sure, there’s wide concerns that Twitter’s product team doesn’t have the same relationship to the product as most intense newsgatherers, but it seems odd that the company, which employs a Head of News executive and frequently touts the importance of the raw feed during live events, would be clueless as to the platform’s standing in the news community. It’s simple: Twitter’s uncurated feed certainly has some downsides, and I can see some algorithmic improvements that would make it easier for early users to adopt the service, but they’d potentially be chopping off the very—sometimes magical—ability of mature Twitter to surface from the network. And the key to this power isn’t the reverse chronology but rather the fact that the network allows humans to exercise free judgment on the worth of content, without strong algorithmic biases. That cumulative, networked freedom is what extends the range of what Twitter can value and surface, and provides some of the best experiences of Twitter. I’m inclined to take these concerns seriously but I’ll keep my powder dry just yet, with respect to upset. My take (yeah, I know) is that if Twitter experiments with giving users of its website an algorithmically curated stream to improve the relevance of what they see, OK… new users may appreciate that product. Or not. Either way, I hope that the company preserves API access for 3rd party clients, like Tweetbot. I hope Twitter preserves user’s ability to use Tweetdeck to view the timeline of people you follow and lists in reverse chronological order. I want to be able to decide, just as I do on the Facebook newsfeed with “Most Recent” vs “Top News,” and just as I want to know that I see every tweet from the people I’ve chosen to follow or put on the list. …there are many, many things Twitter could do to address all of that without breaking its networked, human-prioritizing logic. Much much better tutorials seems like such an obvious step (I have hardly seen good ones). Better suggestions for users to follow, perhaps a dozen at a time, and better ways of trying following groups of people. Right now, it’s all individual and arduous, and that should remain the core option, but the entry ramp could be much faster. Better filtering, too, especially of mentions would be very welcome. I’m craving a timed mute, for example—let me mute out someone who I don’t happen to want to listen that day or that week, without having to mute them permanently. Group chat for DM? Woohoo. DM is among Twitter’s most powerful features because it only allows contact from people one chooses to follow which is a better filter than email, but not as strict a one as Facebook which operates differently. Also, brevity makes DM more powerful. And lists! Twitter can do so much more to make lists more useful to its users to let users decide how to deal with signal/noise and interest ratios. There is so much Twitter can do try to improve the user experience, for both the experienced and the beginner. But I hope that it does not algorithmically curate the feed, not because I love the chronology per se, but because I value people’s judgement. Yes, Twitter can make it easier to access that judgment in more varied ways but stepping between people I choose to follow and me is not the answer. Vis-à-vis the additional products we could see I mentioned that I really again the kinds of experiences we created around topics and live events during the World Cup. We will run a number of experiments to that broader audience those unique visitors I talked about and I wouldn’t want to be specific about the sequence with which roll those out or when you would see those. On your second question, algorithmic timelines for example versus manually curated follow lists I think it’s fair to say that we are not ruling out any kinds of changes that we might deliver in the product in service to bridging that gap between signing up for Twitter and receiving immediate value and you will see a number of kinds of experiments that we produce there. Alexis Sobel Fitts wrote a great cover story for the Columbia Journalism Review this week, as measured by its narrative coverage of the rise of the I f*cking love science (IFLS) Facebook page or its creator, Elise Andrew. Unfortunately, the piece was hobbled by a false title and embedded premise: that this was the first time a journalist or her journalism were entirely self-made, without the help of an existing network or media company. Journalists have been creating self-made brands for many decades, long before media went online. Even if we limited consideration to when journalism started being produced natively on the Internet, much less using social media, there are many media pioneers who were self-made online long before Andrew, with no assistance from mainstream media. I’m a relative late-comer to in that kind of effort, but I’ll note proudly that the media brand I started last year has now been cited numerous times by NPR, Wikipedia and the Speaker of the House of Representatives. I’m not looking for credit from CJR or others: I’m simply noting that by putting up a masthead online and publishing on it, I’m following in the digital footsteps of people who started blogging and putting up websites decades ago, including original journalism and media creation. Boing Boing has been online for some 15 years old now, for instance, but is far from the only such enterprise. What was novel to me about this story was not that aspect — the bold, unsupportable claim that IFLS was this was “journalism’s first self-made brand,” a statement that the author of “Poor Richard’s Almanac” might dispute — but rather how a Facebook page enabled a twentysomething student to build a huge, engaged audience without the cost of reporters, marketing, advertising, distribution, taxes or any of the operational costs that a publisher would have had to bear in past decades. Andrew also took some risks: if Facebook had changed how it showed her content, the page would have suffered. That’s no longer the case: As CJR reported, IFLS has now launched a website, iflscience.com. 3) fact-checking the veracity of 1) and 2). Whether this Facebook account has been “a new form of journalism or even journalism at all is debatable,” Fitts acknowledged in CJR, but as she also reported, IFLS now has four writers, two of whom have journalism backgrounds. Visitors to the site find an engaging mix of colorful photography, articles, animations and videos, organized into taxonomies. Most of the posts I browsed today featured a big photo and a few paragraphs summarizing a report or other news and link to the original source, along with a caption sourcing the media. As I explored, I stumbled upon a lovely piece of longform writing, on strange sailor jellyfish — and that it had originally been published elsewhere. Most are 300-500 words long and link out, which is to say they look and read like many of the blogs in the networks that Gawker Media or Vox Media or that routine end up atop TechMeme. They post are also, on average, incredibly popular on Facebook. The flaws in the CJR cover story are not just about semantics or definitions, at least with respect to an upstart media entity bootstrapping itself without tapping into an existing broadcast power by using digital tools to find new audiences. That’s been happening for a long time, with each succession of media technology, from newspapers to radio to TV to cable news to the Internet. I generally like reading CJR, but the way the publications covers the Internet is occasionally painful, from social media to technology the history of the Web. I’m unsure how the issues in this article got by an editor. I suspect an editor may well have written the headline, as is common at many publications. I was also struck by two unanswered questions on revenue (how much, if any, revenue did she receive from Facebook or sponsors How much traffic does her website receive) and wondered the absence of some big news for the site’s creator: a TV show. If CJR decides to do a followup or digest of responses to reader questions, I’d be interested in reading answers. I briefly logged into Twitter’s free analytics service again today, prompted by a conversation on (you guessed it) Twitter about the demographics of an account’s followers and the news that it was now open to all. Absolutely thrilled to open up access to http://t.co/wcU6oj9hFM to EVERYONE. Check it out, and let us know what you think! Today, any Twitter user can log in and access the online dashboard and see what Twitter says about how people are interacting with your tweets, among other insights. I was glad to see that dashboard is definitely working better now than when Twitter first gave me partial access. (I could see follower demographics but not impressions). I know that some people may see these stats as fake-ish numbers, but I wish Tumblr, Pinterest, Vine, Instagram & Google+ offered similar free dashboards for their users — certainly, it would be great if Facebook did for people who turned on the Follow feature. First, looking at the highest impression number (155,000 impressions on this tweet) I was reminded that the concept of “free speech zones” remains controversial in the United States, and that tweeting about them can result in a different kind “engagements” than RTs or Favorites: angry @replies from lots of strangers. This is particularly true if combined with a journalist embroiled in controversy over a misidentification of ammunition and the #Ferguson hashtag. 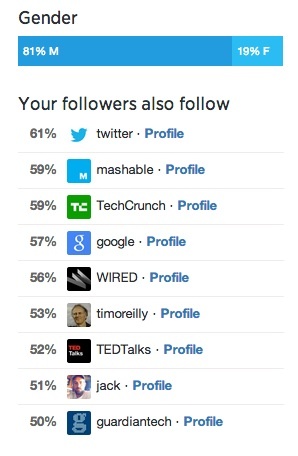 Second, the gender numbers in the demographics of my followers continues to be heavily skewed toward men (81% vs 19%), a situation that has endured more or less ever since the beginning of 2010, when Twitter began recommending me to new users in its technology vertical. I invite and welcome any and all women who like to follow me to do so here, if you’re interested in the sorts of things I tweet about, just as I do on Facebook or other social networks. Finally, what Twitter Media and News staff had already told people who are listening is backed up by what they’re showing me: including pictures, maps and graphics in your tweets will raises your “engagement” numbers, at least as measured by people resharing tweets, favoriting them, @mentioning or @replying to them. I’ve intentionally done that more over the latter half of August, and it shows up in the data. It takes longer to find the right image for a tweet but the effort can pay off. Adding that to the process reminds me of how I described Twitter back in 2008: a distributed microblogging platform. While a few tweets may still be produced and received as simple, humble text messages, as in 2006, many more are much more complicated, and have been for some time. 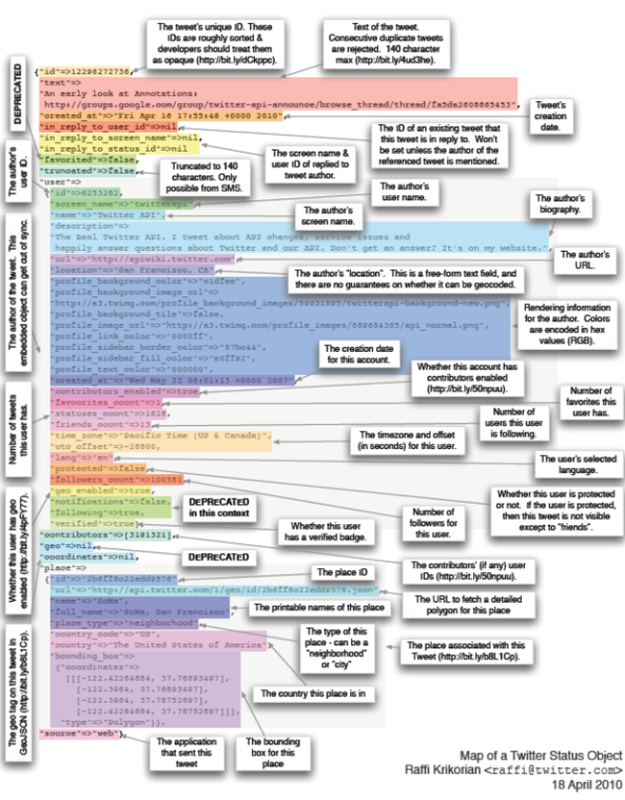 Back in 2010, the map of a tweet already looked like this under the hood, with some 30 lines of meta data. Years later, updates to the platform are much more complex, with integrated cards, videos and pictures. As Twitter rolls out e-commerce from within tweets, I wonder if better dashboards for sales, subscriptions and other conversions might be on the way for the social media company’s customers, if not, perhaps, all of its users. In the virtual world, anonymity and invisibility help us feel uninhibited. Some people are inspired to behave with greater kindness; others unleash their dark side. Trolls, who some researchers think could be mentally unbalanced, say the kinds of things that do not warrant deep introspection; their singular goal is to elicit pain. But then there are those people whose comments, while nasty, present an opportunity to learn something about ourselves. Easier said than done. Social scientists say we tend to fixate on the negative. However, there are ways to game psychological realities. Doing so requires understanding that you are ultimately in charge. “Nobody makes you feel anything,” said Professor Suler, adding that you are responsible for how you interpret and react to negative comments. The key is managing what psychologists refer to as involuntary attention. 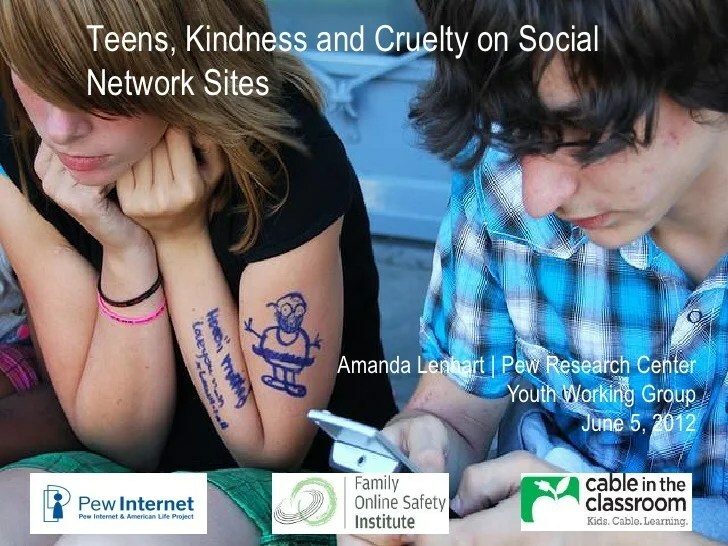 When I checked her reference, I found that Rosenbloom made an error with her citation of research, along with failing to link to it: the 2011 report on teens, kindness and cruelty on social networking sites by the Pew Research’s Internet and Life Project she cited found that a vast majority of young people (88%) had “seen someone be mean or cruel to another person on a social network site,” not 69%. That percentage refers to a happier statistic: “69% of social media-using teens think that peers are mostly kind to each other on social network sites. On that count, I’m glad the author chose to end with a reflection on kindness and the psychology involved with focusing on positive comments and compliments, as opposed to the negative ones. Anyone who wants to see how a positive feedback loop works should look at how Justin Levy’s friends & networks are supporting him, or how dozens and dozens of friends, family and strangers supported me when I lost my beloved greyhound this week. I’m not sure about the New York Times editor’s summary — that the “Web encourages bad behavior,” through anonymity and lack of consequences. 2) what the community norms established there are. While people bear always responsibility for their own cruel actions or words, it’s incumbent upon those of us who host conversations or share our thoughts publicly online to try to respond with empathy, kindness and understanding where we can, and with polite but resolute moderation when others do not respond to those tactics or attack our friends and communities. What Rosen is experimenting with here is social media optimization (SMO), or the art and science of getting your updates seen on Facebook and other platforms. In 2014, SMO is still something of a dark art, but in an age when people are using social media to discover news, getting seen there is now as important to media, marketers and public officials who want to find immense audiences online as search engine optimization has become over the past decade. When they are shown, they get good engagement. The hack puts them in front of people who never received a thing from me, despite subscribing to me. Robert [Scoble] is convinced that’s because I used some humor and sounded like a person. But it isn’t. It’s because I used some idiot phrases (“exciting personal news”) the algorithm responds to. That gives my posts a chance to be seen. When they are seen people engage with them. When people engage with them they are seen by more people. Robert [Scoble] and Dave [Winer] are telling me it won’t work for long and I am sure that’s true. Meanwhile, I have many people telling me they never saw my posts and now they do. Rosen’s tactic prompted Rackspace’s startup liason officer, Robert Scoble, a power user of social media platforms, to make several suggestions for crafting Facebook updates that get seen in the newsfeed. Here’s a short, paraphrased summary of those tips, courtesy of Robert Scoble’s comments on an update in Rosen’s feed. 1) Short, one paragraph updates often get more engagement than updates with a photo. 2) One photo in an update often gets more engagement than an update with multiple photos. 3) Including a call to action with a URL like “Click here for insight on open government, technology and society: http://e-pluribusunum.com” in an update leads to 80% more clicks. I’m both personally and professionally interested in this advice: I have 129,000 subscribers to my public Facebook updates but am quite certain that the vast majority never see what they subscribed to when they clicked the “Like” button. While the rare Facebook update blows up, many are just never seen. 1) Have you tried these techniques? If so, what came of it? 2) What other SMO tips do you use? 3) Do you use Facebook lists? First, just as blackhat SEO leads Google to penalize people for gimmicks, Facebook could flag pages and profiles that overuse them, leading to account issues. Second, marketers, social journalists and community managers that find success with SMO experiments should take note of a recent Pew Research Center survey on social media and the news, the source of the graphics on this page, which found that “visitors who come to a news site through Facebook or search display have far lower engagement with that outlet than those who come to that news website directly.” That means that SMO doesn’t replace SEO for publishers, or the need to create great stories and interactive content that stands on its own. 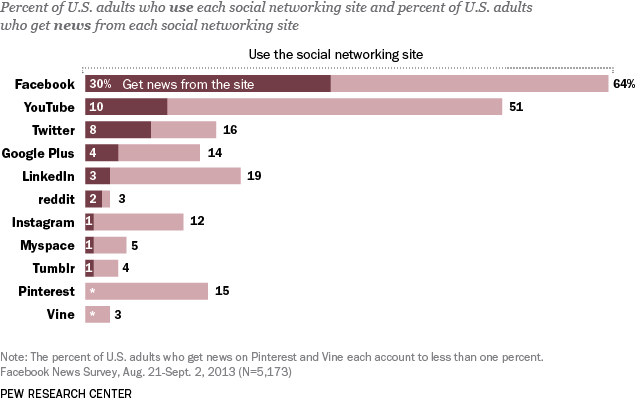 Finally, it’s worth noting that social networks are full of people. Ultimately, the best way to “optimize” your interactions on Facebook or elsewhere is to be a human, not a marketer. Meaningfully communicating with other humans is going to require a different strategy than crafting headlines and URLs that highly relevant to search engines. Hat Tip: Post by Jay Rosen.